We were going for a big fry up this morning – but Jonathan needed to be out at Huxley’s Magic Hub by 10.30 and we fancied a more relaxed start. 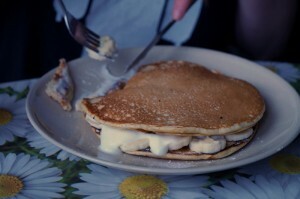 Strangely some people preferred the option of pancakes to the eggs, and had them with banana and yogurt. It certainly felt like an extravagant breakfast today. So we had £7.36 extra that we could have spent – we could have had a piece of fruit and some more pulses everyday. Martin says he will blog more reflectively about the week later. We’ve managed to stay under budget all week so we decided that this evening we could go and buy some extras – some fruit! Everyone is saying that they are feeling much more hungry today and that is despite that fact that we seem to have eaten more. It was the first day that Jonathan has even commented that he was hungry. We managed to buy some reduced things, so had some fruit and crisps. Martin has been eating some other things than the rest of us as he is trying to avoid wheat. His fake Ryvita and cream cheese today cost 29p almost 3/10 of the daily allowance on just a snack. 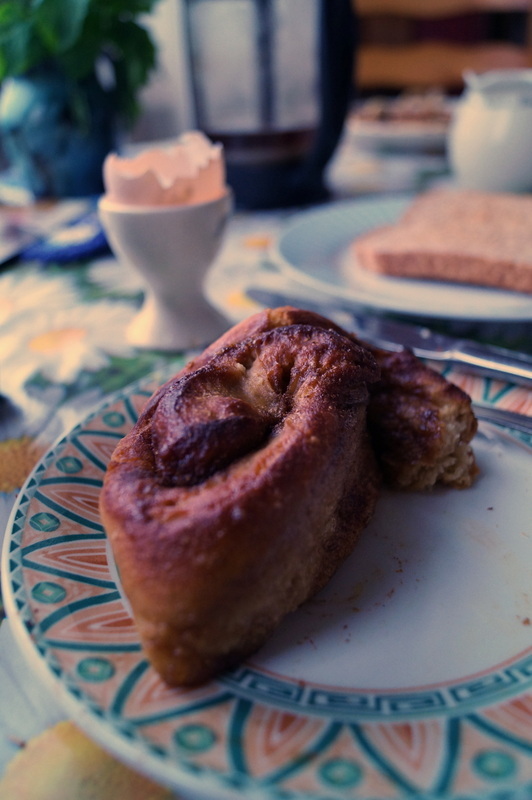 I did steal a few bites of it and boy did it taste fantastic – it was the crispness and the cool creaminess in contrast to a lot of the food which has been just a bit mushy! 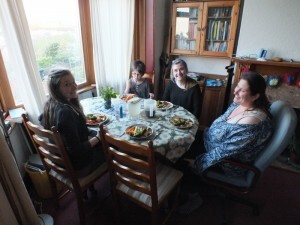 We’ve had quite a lot of discussion today about how it would feel to always be eating like this and really worrying about having enough to eat and we are pretty careful anyway only having a budget of about twice as much as this – but that twice as much feel extremely extravagant just now. Things I am missing eating are salad, fruit, yoghurt and cheese and earlier in the week I had a real craving for a jacket potato with butter and cheese but now what I really want is hummus and carrot sticks and oatcakes – blimey how middle class do I sound! Wednesday was luxury day – we managed to get some reduced bananas and broccoli in the greengrocers and very excitingly we had a joint of pork that had been reduced from £4.99 to 70p and will do us for 2 days. We also had a break from porridge and had some scotch pancakes – with the value jam. I was so so so excited by the prospect of eating a banana – but even reduced that were still over 12p each which is a massive amount of the budget. But the banana was definitely my highlight. 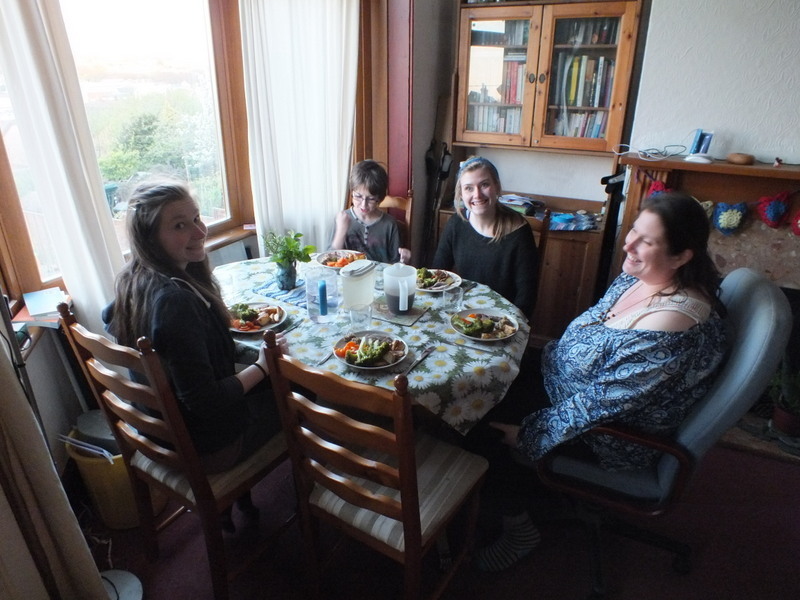 Some of the others were massively excited by the broccoli. 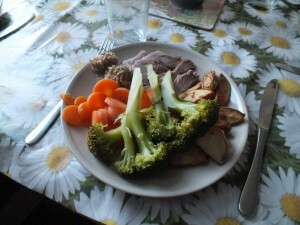 The dinner was very similar to what we would eat on a good day at home – we might well have had more veg and the stuffing might be value but usually we would have augmented it with grated apple or sosmix or something. The wedges would have had olive oil and paprika and turmeric and herbs rather than melted marg and salt. We often have pancakes here as they are cheap and tasty – but I have to say I really like mine with natural yoghurt, banana and a drizzle of maple syrup or honey not value strawberry jam! But it was definitely a relief not to have porridge again. £1 a day – To bulk buy or not to bulk buy? We’ve had a lot of discussion about bulk buying as part of our £1 a day challenge (or perhaps we should say £5 a day challenge, since we are feeding ourselves collectively which is definitely cheaper and easier than a single person attempting £1/day). I’ve also been reading some other people’s views on it on another blog. I can’t say as we really have a coherent position on this. I guess few people even if living below the poverty line have an exact amount of money to spend on food on any given day. Food will often be bought when money is available, which may mean some “bulk” buying. However the reality for most people living on a low income (even if not in extreme poverty) is that full on bulk buying is beyond their reach. Many people have to buy things at higher prices in smaller quantities because they can’t manage the higher initial outlay for a bulk purchase. In the end we have a bit of a fudge and I’m ok with that. The purpose of this is not to pretend we are actually living like people in extreme poverty – there are just too many other differences. Rather we are looking to challenge some of our thinking about what living below the line might be like, look at how we consume food and drink differently, and give up some of our spend on food to help others lift themselves from extreme poverty. So, we have bought a sack of potatoes the size we normally would and only accounted for what we are using in the 5 days. We’ve also used “store cupboard ingredients” and accounted for the appropriate portion of these and we’ve bought eggs in a quantity that we wont get through in 5 days. Cheating? Maybe, but it’s hard to calculate what you would actually buy just for that day or week and what you might buy for a slightly longer period.